Heres a whole lot of picture spam of Violets 4th birthday party! I still can not believe me baby is 4 years old already! Violet for the first year had an actual party, we hired a local village hall, and used a company with a bouncy castle/ diddy car, bubble machine and animal hoppers package, it was really reasonable and the best entertainment ever honestly! The children didn't want to leave! As for food i headed to Costco and cooked 2 super large cheese pizzas at home and brought them to the party with some healthy nibbles of carrots & cucumber sticks as well as some cheesy puffs. Ive done many parties in the past for Alister and general family get togethers and theres nothing worse than over doing it with the food and seeing it waste. The sweet was obviously the birthday cake again i ordered it from Costco hey have an online click and collect with their cakes and they are so reasonable and huge at only £9.99! For the PARTY Bags i just used a few bits from the local 99p store, bubbles, curly straw, princess wands, and a cupcake that i made! 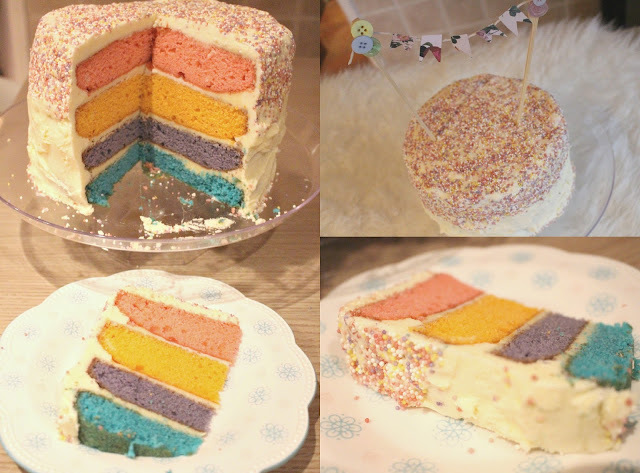 This cake i made for Violets actual birthday using just an average Victoria sponge recipe with butter cream frosting & sprinkles! Cupcakes i made for the kids to take home. Pink & Gold Table Set up. Me with my chunky little Nephew. Well that seems to be the lot thank you for my friend Sophie for taking a few good snaps also! It was a lovely fun afternoon and not too stressful at all! Just for reference we used the hire company Get up and Bounce which we have used before and always had great service!